So a funny thing happened… well not funny I suppose, but a thing. A surprising thing. The winner of the Pixie Mood Purse Giveaway never claimed her prize! I emailed her twice, and I tried to contact her on Facebook and on Pinterest, but zip. Nothing. Nada. No response. As the rules clearly explain, “Potential winner must accept a prize by email as directed by Sponsor within 48 hours of notification. Any winner notification not responded to or returned as undeliverable may result in prize forfeiture.” So now that it has been well over 48 hours since I tried to contact said winner, (it’s actually been 64 hours), I have to forfeit the entry. I didn’t like doing it, but the good news? We have a new winner!!!!!!!! 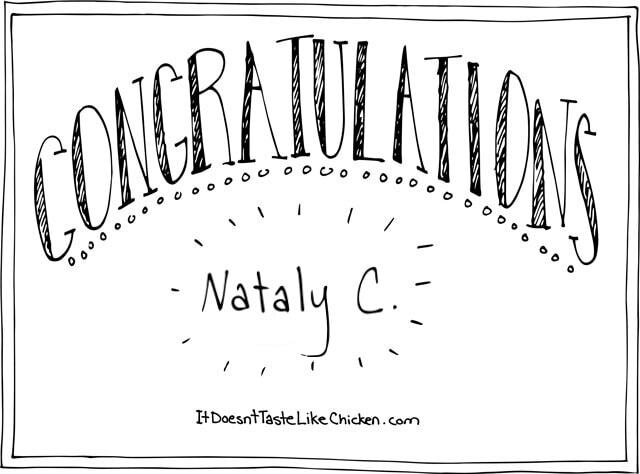 Congratulations to Nataly C. You are the new winner of a Pixie Mood Purse! I will be contacting you via email to collect your shipping address and colour choice. Pretty please with a cherry on top, collect your prize!! To those of you who missed the other good news, Pixie Mood was so very kind to give every single one of you a 20% Off Discount Code! So hop on over to Pixie Mood and pick up whatever glorious purse you like, and just enter discount code SAM20OFF at checkout. This deal expires April 18th. You know those delicious, addictive, expensive crackers, that seem to be the new trend at the snack tables all of a sudden. Well that’s what this recipe is for. It’s a bummer that these fancy crackers aren’t vegan (they contain milk), but I have the best news for you: they are super easy to make, and will save you money too! I know, it’s so exciting. Well, I’m excited anyways. Wow, so that’s where my life is going, eh? I get excited about crackers. 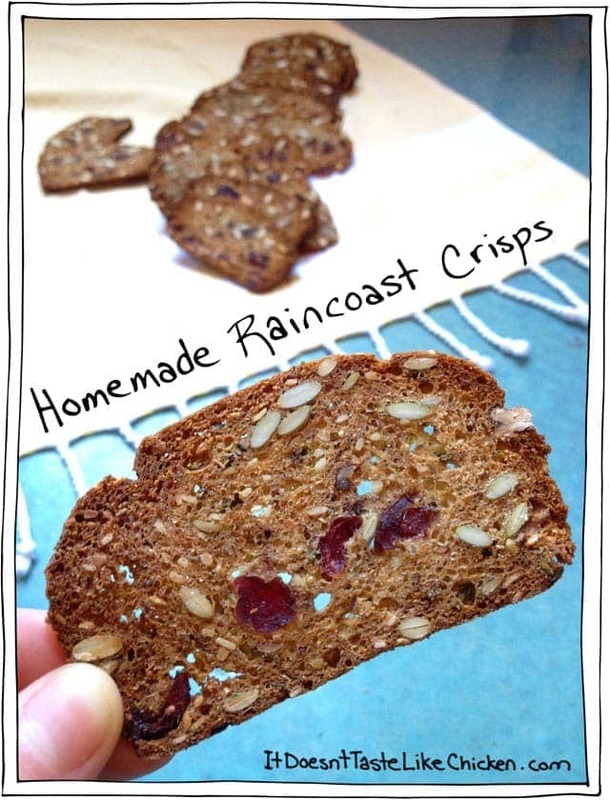 These crackers are seasoned with dried cranberries, rosemary, and all sort of nuts and seeds. 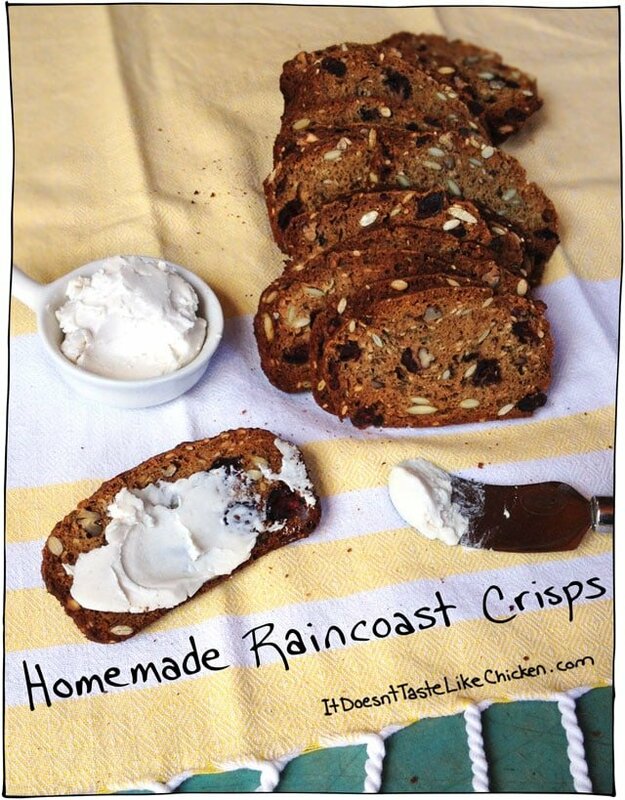 They have that lovely crisp and chewy bite, and will definitely impress when you tell everyone they are homemade. When Andrew tried them he said something along the lines of “Holy Sh..bllllleeeeeeppp!” That’s how good they are. Preheat the oven to 350 F (180C), and lightly grease 2 loaf pans. The first step is to make buttermilk. 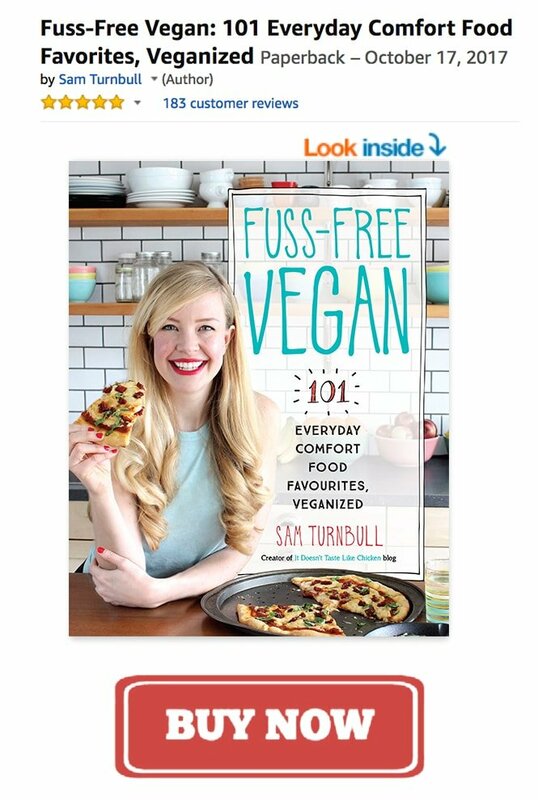 Wait, wait, wait…what is vegan buttermilk!? I have to make the buttermilk? Here we go. Are you ready? 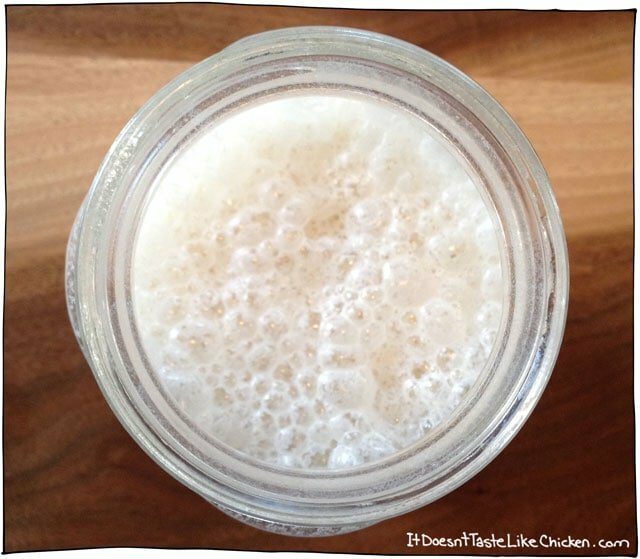 Add your non-dairy milk and vinegar to a bowl, jar, or glass. 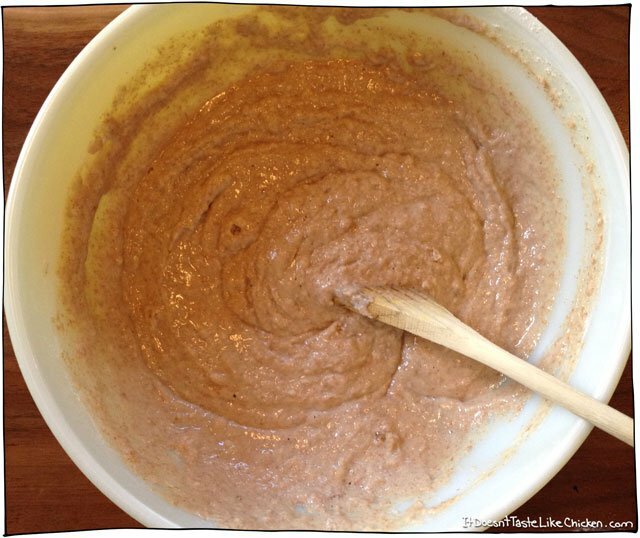 Give a stir and then…. wait… that’s it. You’re totally done. You made buttermilk. Whew! Let that sit for about 10 minutes while you mix the rest of your ingredients. It will get all weird looking and start to separate, so just don’t look at it. If they aren’t already chopped, chop up the pecans and rosemary and set aside. 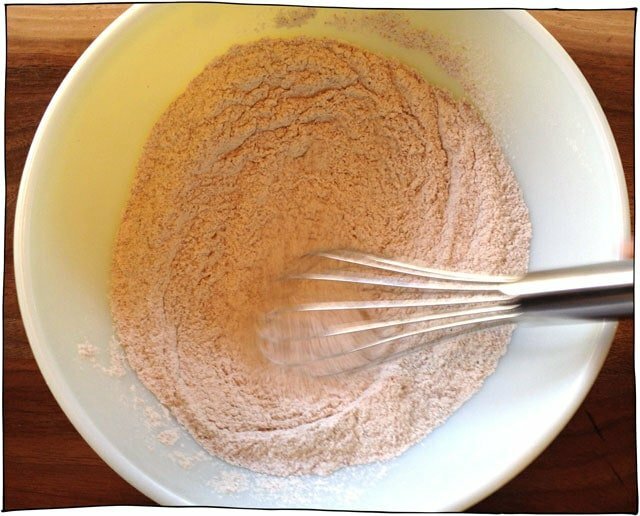 Now measure the whole wheat flour, baking soda, and salt into a big bowl, and give a whisk. Then add the brown sugar, agave, and your freshly made buttermilk, and mix until just combined. Don’t beat it to death, just lightly combine it. Dump in all your fun cracker flavour ingredients. 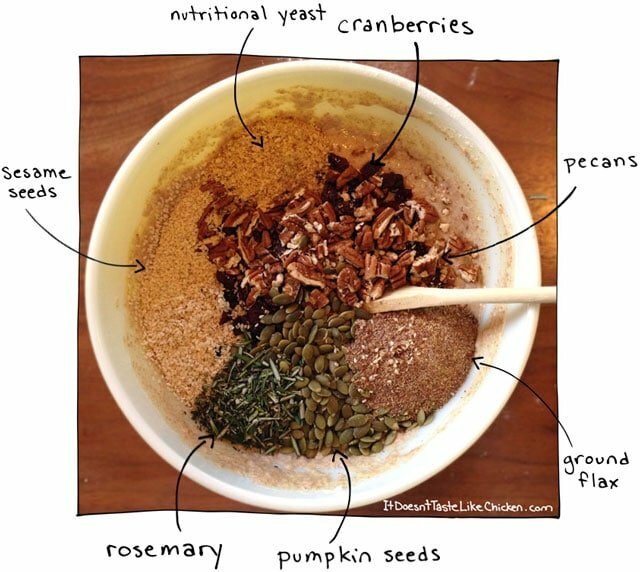 The cranberries, pecans, pumpkin seeds, flax, sesame seeds, nutritional yeast, and rosemary. Give a stir until just incorporated. Aren’t you feeling so healthy already? What a beautiful combo of healthy ingredients. 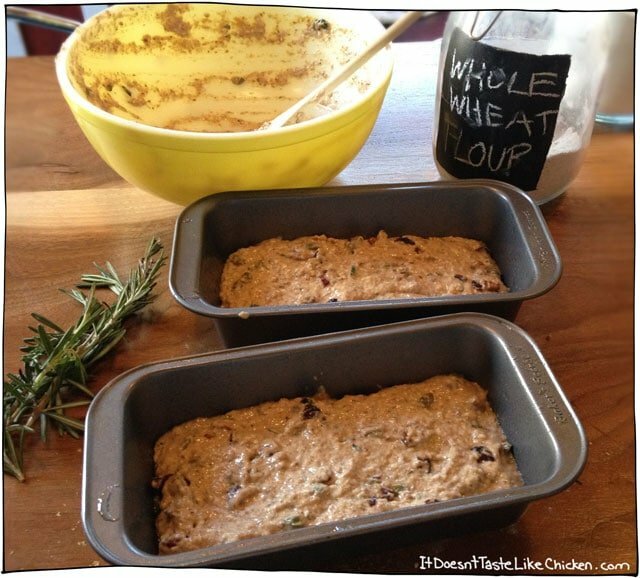 Divide the batter into two loaf pans, and pop in the oven for 35 minutes. When they are ready they will be golden brown and feel like a dense bread. Let cool completely. I really wanted to get my crackers thinly and evenly sliced, and I found the best way to do this is to make sure your loaf is cool. I tried freezing a loaf, but it was too difficult to slice, and it didn’t bake properly. 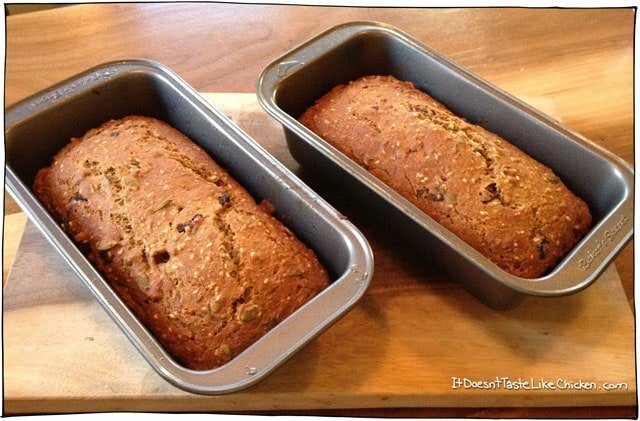 The best method is to let the loaves cool in the fridge for an hour or two before slicing. 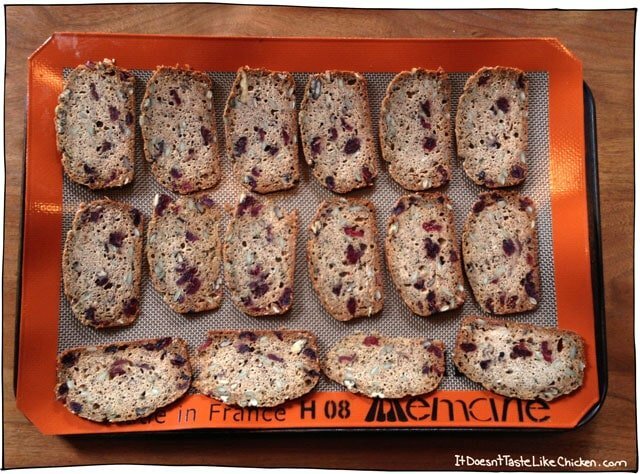 Thinly slice your loaf into as many crackers as you can. I had an average of about 40-45 crackers per loaf. Are you wondering what to do with the end that is too dangerous to cut into more crackers, but too fat to be a cracker by itself? 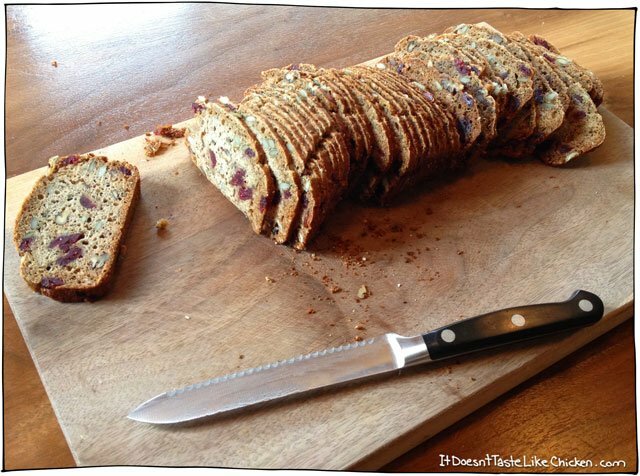 Pop it in the toaster, spread with a little vegan butter, and enjoy as a snack while you are waiting for your crackers to bake. Lay your crackers in a single layer on a non-stick mat or parchment paper, and then bake for around 15 minutes until evenly browned. They will crisp up as they cool. They can be stored in a sealed container, or even freeze them for another time. Serve with your favourite spreads, dips or enjoy just as they are. Previous Post: « Pixie Mood Vegan Purse GIVEAWAY! It was AWESOME just perfect crackers! Hey there, I just had a little question, perhaps a silly one. But is the nutritional yeast in this recipe solely for flavour? I have been perusing your site for way to long lol. I am absolutely in love, though!! So many recipes to try! Hi Amanda, not silly at all. Yes its for flavour. In general I always use nutritional yeast just for flavour, so when it is in small quantities like this, you can skip it if you wish. This is literally life changing!!! Lol! I have been addicted to those dang crackers for years but recently stopped buying them because I’m transitioning to being vegan. I was so sad but now…. Thank you so much for sharing!!! Would you have a calorie count? Yes no problem Mary. I just calculated it and it would be 36 calories per cracker.